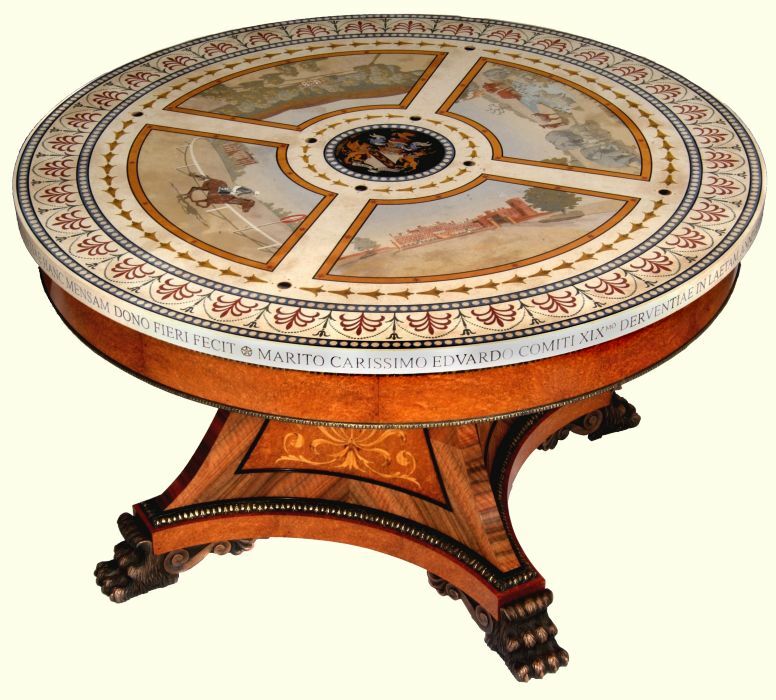 The Countess of Derby gave her husband, as a tenth wedding anniversary present, this extraordinary scagliola-topped table, (below left) one of the most ambitious and imaginative country-house furniture commissions of recent years. Michael Hall talks to its designer, Thomas Messel, about his collaboration with his patron on the table’s design and with the craftsmen who realised it. There is a widespread perception that historic English collections that have remained in the hands of their original owners are frozen in the past, except when diminished by sales. The liveliness of current private country-house collecting and patronage comes, therefore, as a surprise to many, yet it is a natural consequence of the remarkable upsurge in the fortunes of these houses in the past twenty years or so. Family seats, such as Arundel Castle in Sussex or Duncombe Park in Yorkshire, that once seemed too large or inconvenient for modern ways of life have been recolonised by their owners, redecorated and refurnished. One of the great success stories has been the renaissance in the past eight years of Knowsley Hall, near Liverpool, which has been the seat of the Stanley family, Earls of Derby, since the fourteenth century. It is a story that explains the joie de vivre as well as the splendour of the Countess of Derby’s commission of a spectacular table for her husband, the 19th Earl, to mark the couple’s tenth wedding anniversary this year. Presented to him last month, it is published here for the first time. When the Earl inherited the estate in 1994, at the age of 32, the main house – a rambling building of formidable architectural complexity – was no longer lived in by his family, who in the 1960’s, had built a more convenient house in the park, designed by Claude Phillimore, and had let part of Knowsley Hall to the Merseyside police force. He decided to reclaim the house, and in 1997, with his wife, Caroline, began the mammoth task of repairing, rewiring and replumbing, decorating and furnishing. The new house was not given up, however, and remains a private retreat on an estate that now buzzes with events and activity throughout the year. When it came to take stock of the new house, Lady Derby called in Jonathan Bourne for advice. His rearrangement of the furniture left an important room, the ante-room to the drawing room, without a centrepiece. Knowing her husband’s enthusiasm for furniture (before his marriage he commissioned a sideboard from David Linley), she decided to find a designer for a new centre-table as a surprise present for their tenth wedding anniversary on 21 October this year. With the advice of her sister, Amanda Murray, the interior designer, she asked various designers for suggestions, among them Thomas Messel. His imaginative proposal for a neo-classical table modelled on Thomas Hope and rich in references to the Earl of Derby’s family and interests was commissioned in December last year. If anyone was predestined by their genes to be a designer, it is Mr Messel. His surname is famous, of course, as his uncle Oliver Messel was one of the twentieth century’s most stylish designers of interiors and theatrical sets. His great grand-uncle Alfred Messel was a notable German architect in the nineteenth century, designer, for example, of the Pergamon Museum in Berlin and his grandparents, Leonard and Maude Messel, created the celebrated garden at Nymans; the photographer and designer Lord Snowdon is a cousin. Mr Messel had a varied career before he settled to designing, including time in the Household Cavalry and his family’s stockbroking business, L Messel & Co. In 1977, he started work as an interior designer and in 1980 set up his own furniture design studio. He has a busy international practice, with projects ranging from refurbishing the suites at the Dorchester Hotel, created by Oliver Messel to designing furniture for the late Joan Rivers. Most of his clients are American interior designers, often with impatient clients and near impossible deadlines. The Derby table was by contrast a relaxed job that was, far more than usual, a close and happy collaboration with the client (who kept the project a secret from her husband). The most striking feature of the table is the scagliola top. This was Mr Messel’s suggestion, but was prompted by Lady Derby’s wish to incorporate into the table figurative scenes that would convey her husband’s interests and achievements. Scagliola, an ancient Roman technique revived in the Renaissance, is in essence the imitation of marble or hardstone with a powdered crystalline version of gypsum, which is mixed with glue, coloured and polished. An expert craftsman can use it not only to imitate pietra dura but also to achieve almost painterly effects. Mr Messel had designed for scagliola before (notably for David Hicks), but making use only of abstract patterns and decoration. The table top’s creation was entrusted to one of the finest living exponents of the craft, Thomas Kennedy. Based in Shropshire, and almost entirely self-taught, he is the only craftsman in the UK making figurative scagliola (the taste for unusual crafts runs in the family; his father, Hugh, makes armour for elephants). Mr Messel’s first task was to visit the table’s intended setting. This has influenced the design in two important ways. First, the house’s painted Chinoiserie wallpaper suggested a palette for the scagliola: soft shades of terracotta, green, buff, lilac and dusty blue. Secondly, the presence in the adjoining drawing room of one of the most celebrated masterpieces of English cabinet making; the commode made for the 12th Earl of Derby by Ince and Mayhew in 1775 to a design by Robert Adam, suggested the decorative vocabulary, notably the acanthus border around the edge of the table top. In additional, Lady Derby had specific requirements: as well as the figurative scenes, she wished to incorporate plaques of Derbyshire Blue John, the rare lapis-coloured hardstone that was used so memorably by Matthew Boulton in the eighteenth century. Intrigued by the fact that it is mined near his Cheshire home, Crag Hall, the Earl of Derby collects pieces made from it – although as Lady Derby points out, it is so rare and valuable that thimbles are all he can afford. She also wished the table to include both her husband’s coat of arms (he has a great interest in heraldry) and a dedicatory inscription to him that would mention their three children. It was Mr Messel’s ingenious idea to use the Blue John in small roundels that lend sparkle to the table top, and in a plaque made up of fragments that forms the background to the coat of arms at the centre. The stone was obtained from the one quarry that still mines it – in tiny shards – the Ollerenshaw works at Castleton, Derbyshire. Lady Derby’s final prerequisite was that the table top be deep enough to accommodate drawers to house visitors’ books. With great mastery, Mr Messel has woven these motifs and ideas into an impressively bold design. The form of the table is strongly architectural, based on a table by Thomas Hope in the Victoria and Albert Museum, but amended to have four feet rather than three. Like an impresario, Mr Messel has marshalled a team of outstanding craftsmen to execute it. The cabinetmaking was entrusted to a firm of young craftsmen, Jonathan Rose, based in rural Wiltshire; the table is largely the work of one of the senior men, Stuart Crowhurst. The base is made of rippled walnut and amboyna, inset with marquetry of acanthus in satinwood (sand-burnt for three-dimensional effect), which was done by a Welsh firm, Anita Marquetry. The mounts of brass egg-and-dart moulding were made by Optimum Brasses in Tiverton; the table’s wonderfully shaggy bronze feet were modelled by Peter Walwin and cast by Whiteway Craft in Gloucestershire. This element was Mr Messel’s tribute to his patron, for they are derived from the feet of the lion supporters on the coat of arms of her own family, the Nevilles; she is a daughter of the 10th Lord Braybrooke. This tribute is justified: Lady Derby took a very close interest in every stage of the design and Mr Messel’s beautiful watercolour designs for the figurative scenes in the table top were returned with numerous observations and suggestions. The four scenes chosen are Knowsley Hall itself, to reflect her husband’s achievement in its restoration; their Cheshire sporting estate, Crag Hall, where he has restored the moor, encouraging recolonisation by grouse; their beloved racehorse Ouija Board, who in 2004, won the Oaks at Epsom (by seven lengths); and the safari park at Knowsley, a centre for Lord Derby’s interest in the conservation of wildlife, where he has successfully bred elephants, rhinoceroses and re-introduced giraffes. The execution of these scenes in scagliola is a triumph, but it is scarcely less astonishing than Mr Kennedy’s virtuoso inscription around the rim. ‘Caroline, the Countess of Derby, commissioned this table to be made as a gift to her beloved husband, Edward, 19th Earl of Derby, to celebrate joyfully the tenth anniversary of their marriage, on 21 October 1995, and of their delight in the lives of their children, Henrietta, Edward and Oliver’. One reason why the table is so memorable is the way is successfully unites the base’s strong, dark architectural form with the delicately colourful and festive top. Is it too easy to say that this suggests a union of masculine and feminine? Perhaps, but what could be more appropriate for a gift on such an occasion?